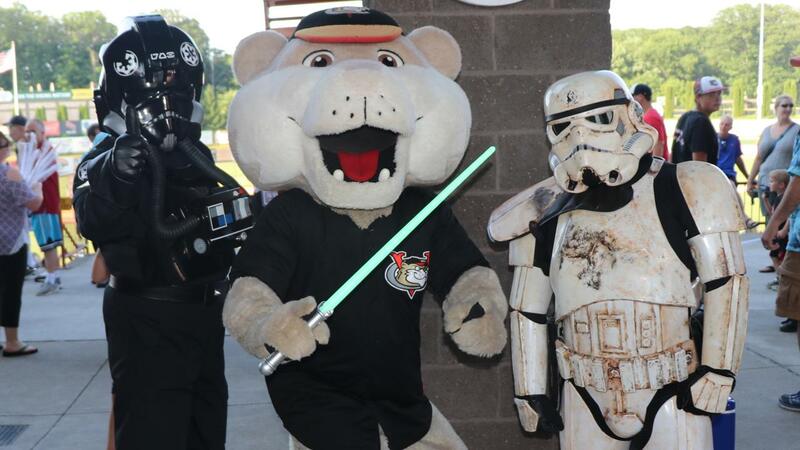 Star Wars Night at "The Joe" on Saturday, July 27 is just one of the many great promotions planned for the 2019 season! TROY, NY - The Tri-City ValleyCats, a Class A affiliate of the Houston Astros, have announced a piece of their 38-game 2019 summer promotional schedule at Joseph L. Bruno Stadium. Opening Night on Sunday, June 16 will feature a Father's Day Sunday Funday Celebration, and the ValleyCats 2018 New York-Penn League championship banner will be raised. The Championship Celebration continues on Monday, June 17, presented by Rensselaer County Department of Health, as the first 1,500 fans will receive a replica championship ring. Other announced giveaways include a bobblehead of former ValleyCats player and Red Sox World Series Champion J.D. Martinez, presented by Snapple. The bobblehead giveaway will take place on Capital Region Baseball Heritage Night, presented by Family Danz Heating & Cooling on Monday, August 5th. The ValleyCats 2019 team poster giveaway, presented by TD Bank, will take place during Boots, BBQ & Baseball Night on Tuesday, July 30. The ValleyCats unofficially begin their season on Wednesday, June 12 with an Education Day exhibition game vs. the Albany Dutchmen of the Perfect Game Collegiate Baseball League. This is the fifth year in a row the ValleyCats and Dutchmen will meet, with the game serving as an educational field trip opportunity for local schools to showcase how S.T.E.M. and other academic subjects integrate with the game of baseball. Fan favorite promotions making their return in 2019 include Bark in the Park on June 23, Wizard Night and Softball Night on July 12, Heroes Night on July 17, Veterans Night on July 18, Star Wars Night on July 27, NFL Night on August 25, and SouthPaw's Not So Scary Halloween on August 26 presented by NY's 529 College Savings Program. Additional promotions include MiLB Pride on June 28, Public Safety Awareness Night on July 19 presented by National Grid, a Swishes for Wishes fundraiser for Make-A-Wish Northeast New York on July 28, and a Labor Day 3:00 p.m. matinee game to close out the 2019 regular season. Other matinee games include two Camp Days on July 9 and August 1. Both have a first pitch of 11:00 a.m. and are geared towards summer camps, senior groups, and business networking opportunities. Cooperstown comes to "The Joe" for Baseball Hall of Fame Night on Friday, June 21 as the ValleyCats recognize youth baseball leagues from across the Capital Region as part of their Youth Baseball Night Celebration, presented by Hannaford Supermarkets and BlueShield of Northeastern New York. Hannaford will also be presenting Hannaford Helps Fight Hunger Night on Friday, July 26. Fans who donate three non-perishable food items will receive a free ticket to the game or voucher to future game. Irish Night will be on Wednesday, August 7 with pregame live music from award-winning Irish band Hair of the Dog, a corned beef & cabbage dinner special, and postgame fireworks. Italian Night is scheduled for Thursday, August 15th and will feature Italian dinner specials, also with postgame fireworks. There will be two Hops & Hits events at Joseph L. Bruno Stadium in 2019, the first on Medieval Times Night Saturday, June 29, and the second on Saturday, August 31. A special ticket package consisting of dinner and a craft beer tasting will be available for both nights. Each Sunday at "The Joe" is Sunday Funday, with gates opening two hours in advance of the game for family fun activities. Members of the ValleyCats will read a book to the children in attendance, followed by a pregame catch on the field, and postgame kids will have the opportunity to run the bases. The ValleyCats previously announced that there will be 15 fireworks shows throughout the 2019 season. The rest of the 2019 promotional dates and giveaways, including a second bobblehead and multiple jersey auctions, will be announced at a later date. Each promotion is subject to change. Season tickets, mini plans and flex vouchers for the ValleyCats' 2019 season are currently available for purchase online at tcvalleycats.com or by calling 518-629-CATS. The ValleyCats are also taking reservations for groups of 20 or more, and individual tickets are set to go on sale at 10:00 a.m. on March 28, MLB's Opening Day.